Team-mates Regan Grace and Morgan Knowles were pipped at the post for the Super League Young Player of the Year award. Saints 20-year-old Welsh internationals, who are hoping to be selected in the country’s final Word Cup squad next week, finished behind Wigan’s Oliver Gildart in a vote by national newspaper men. But one accolade did come St Helens way and the annual awards dinner - prop Alex Walmsley the top metre maker with 4256. Castleford’s scrum half Luke Gale picked up the major award - the Steve Prescott Man of Steel. Gale has been in the best form of his career this year, most recently in the Betfred Super League semi-final against St Helens where he clinched the win for the Tigers with a golden point drop-goal in extra time, 16 days after emergency surgery to remove his appendix. Short-listed alongside team-mate Zak Hardaker and Hull FC stand-off Albert Kelly, the 29-year-old England international has been influential in leading Castleford to their first Grand Final, scoring over 300 points throughout the season. He received the prestigious award for being the stand-out performer in 2017 at the Betfred Super League Man of Steel dinner held at the Monastery in Manchester. Gale secured the award following a ballot of all Super League players and beat team-mate Hardaker who finished in second place by 32 points. For the second year running the selection of every Super League player who voted has been made public. Each Super League player votes for three players they feel deserves the award, with their first choice receiving five points, second choice receiving three points and third choice receiving one point. This year’s winner Gale voted for Hull FC’s Mahe Fonua as his Man of Steel, whilst second placed Zak Hardaker voted for Fonua’s teammate and third placed Albert Kelly. Kelly voted for Salford Red Devils second row Ben Murdoch-Masila. Last year’s winner Hull FC’s Danny Houghton agreed with the majority of his fellow professionals and voted for Luke Gale in first place with Joel Moon (Leeds Rhinos) and George Williams (Wigan Warriors) in second and third. Retiring duo Rob Burrow and Gareth Ellis voted for Ben Roberts (Castleford Tigers) and Luke Gale respectively. England and Wigan Warriors captain Sean O’Loughlin opted for Zak Hardaker, Luke Gale and Gareth Ellis as his three choices. Tigers boss Daryl Powell was named Coach of the Year, as voted by his fellow peers in the game. Powell has transformed the Tigers team since he took charge in 2013 and has led them to their first ever League Leaders’ Shield and first appearance in a Super League Grand Final. It’s been a special year for Castleford Tigers who were also named Betfred Super League Club of the Year. Not only have they experienced on-field success but the club has turned itself around off the field and have increased their attendances by 13 per cent in the 2017 regular season and by 23 per cent when incorporating the Super 8s fixtures. 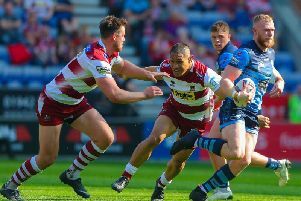 Wigan Warriors were named the Super League Foundation of the Year. Their programme has seen nearly 4,000 sessions delivered to over 53,000 people throughout the year. Retiring Super League players Thomas Bosc (220 appearances), Chris Bridge (248 appearances), Rob Burrow (428 appearances), Eorl Crabtree (347 appearances), Gareth Ellis (299 appearances), Andy Lynch (452 appearances), Iafeta Palea’aesina (220 appearances) and Leon Pryce (432 appearances) were also presented with Outstanding Achievement in Super League awards to mark their long service to the competition having made over 200 Super League appearances.